I will admit that Action Tomales Bay, an organization of people who would like to end waterfowl hunting in the Tomales Bay Ecological Reserve, has always made me feel conflicted. As a waterfowl hunter that grew up close to Tomales Bay and who knows families that have hunted the Bay for generations, I feel protective of one of the last public lands for legal waterfowl hunting available in our neck of the woods. On the other hand, I know how the sound of a shotgun travels across the water, and I know that not everyone understands or is accepting of hunting for food. If I had to listen to something that morally bothered me 100 days a year, I would not be a happy either. It’s the ability to put ourselves in someone else’s shoes to try and understand their perspective that allows us as a society to engage in civil discourse. If someone who is anti-hunting or anti-guns is open to having a discourse with me about why I choose to hunt or own guns, I love the opportunity to not only present my perspective, but to learn about theirs. There is no harm in disagreement, and it is not necessary for a difference in opinion to breed animosity. If someone hates me because I hunt, it makes me sad for both of us. What troubles me more than anything and has the most potential to breed animosity in highly charged debates such as hunters vs. anti-hunters are the lies and accusations that can be lobbed by both sides. I believe that both hunters and anti-hunters have plenty of valid reasons for their stances, and I personally am unwilling to declare one side absolutely right or absolutely wrong. My position on hunting is based on my opinions, not irrefutable facts. Some people go down the road of trying to justify hunting by affirming our status on the food chain, or a variety of other explanations. That’s fine, but for me, my logic and stance is a product of my upbringing, my experiences and my opinions. The only “facts” I am willing to cite revolve around the well-known and documented deplorable conditions that the majority of the factory farmed animals in our country are subjected to. My point with this discussion of facts and opinions is that it is important to know what is fact and what is opinion, and it is important to be honest and accurate about the things we put forward as fact. While looking at the Action Tomales Bay website, I noticed a photo on the homepage with the caption: “Below is a photo taken on Tomales Bay of 18 shot birds. 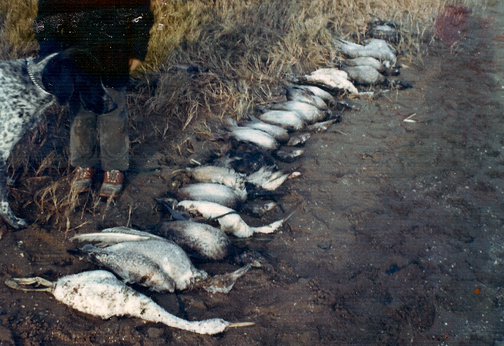 This is the legal daily ‘bag limit’ — 18 birds allowed per hunter per day for the 100 day ‘season’.” The photo displays a line-up of between 16 and 18 dead birds in the sand, the lower-half of what looks like a child standing by, and a dog. However, the majority of the birds in the picture are not waterfowl, nor are they legally hunted birds in the State of California. There are a few reasons this picture is so upsetting to me. First, as a hunter, I believe the laws and guidelines that regulate hunting are valid and have a scientific basis; the “bag limit” of waterfowl is subject to change every season in response to state, national, and international biologists’ review of things like population strength, breeding habitat conditions, and other data. Second, hunters who flaunt the law not only negatively impact waterfowl and other species, but also they make all hunters look like scofflaws and make it harder for me and my hunting friends to engage in a civil discourse with people who don’t like or understand what we do. I was looking at your website home page, and noticed that the photo you state is of Tomales Bay and claim is a bag limit actually has several birds in it that are not ducks, geese, or birds otherwise legally hunted in Tomales Bay or anywhere else in California. I can’t say that I particularly support your cause, but I thought it might be prudent to let you know that portraying that photo as a result of a legal day of hunting is not accurate in any sense. I’d be interested to know where you got this photo. If you know who it belongs to, I encourage you to report these people to the California DFG as they have violated several Fish and Game codes. If you don’t know who it belongs to and cannot verify that it is Tomales Bay, a hunter, or anything thing else you claim on your website, I would suggest it is disingenuous to claim it to be such. Needless to say, no one responded to my inquiry. I recently wrote to you regarding a photo I saw on Action Tomales Bay’s website labeled as a “bag limit” of waterfowl shot on Tomales Bay. As you did not respond to my inquiry, I would like to formally request that you remove the photo, as I believe it to be wholly disingenuous to depict this photo as representing a “bag limit” of waterfowl harvested on Tomales Bay. A “bag limit”, by definition, must contain only species that can be legally hunted under state and federal law. Most of the birds in the photo on your website are not waterfowl, and are not legal species to hunt in Tomales Bay or the state of California. As I stated in my previous email, if you know the origin of the photo and know for a fact that it was taken in Tomales Bay, in the interest of the environmental conservation and preservation you claim to support, it is your duty to report these blatant offenders to California Fish and Wildlife. I can provide you with the CAL-Tip number to make such a report if you do not have it. If you do not know the origin of the photo, making a claim that it was taken in Tomales Bay by hunters is disingenuous and undermines the spirit of honest dialogue that we as members of this beautiful community must strive to embrace. If you do not reply and engage in discussion with me on this topic, and/or you do not remove the photo in the interest of honesty, I am inclined to write a letter to the editor of both of our local papers about my efforts to discuss this important topic with you. It is not my objective to slander your efforts, as I firmly believe everyone has a right to their opinion and should engage in a spirited effort to educate people about the basis of that opinion. However, education should be based on fact, and in some cases educated opinions or the results of scientific inquiry. However, there should be no room in education or informed debate for willful lies, omissions and mischaracterizations. In the spirit of honesty and transparency I hope you respond or remove this photo from your website. Alas, still no reply. I suppose by now you get the point of me taking the time to write this post. I don’t want to embarrass anyone, call anyone out, or try and assert the moral high-ground for the sake gloating about it. What I do want is for Action Tomales Bay to be responsible and be honest. They have plenty of valid underlying claims to support their cause. Based on the birds displayed in the picture, my personal judgement is that this photo was not even taken in the United States, and I am nearly positive it was not taken on Tomales Bay. It is my personal opinion that the West Marin community has faced enough divisive rhetoric and strife about contentious environmental issues in the last few years. That being said, these issues are important, worth our time, and deserve honest, transparent debate. I don’t think that is too much to ask for, and I hope that Action Tomales Bay either removes the picture and admits that it does not know the origin and that it is not Tomales Bay, or that it does the right thing and reports the poacher that took the picture to the California Department of Fish and Wildlife. In this paper I seek to explore various policy approaches to the urban environment that prioritize capital accumulation through securing access to spaces by preferred publics. I will mainly focus on downtown development projects, but touch on some concepts that explore the preferred publics of suburban shopping malls and other spaces of consumption. Because most of the literature we have reviewed has dealt with western policies and built environments, I also hope to reflect on how these themes relate to the production of space in Beirut. Since beginning the graduate program in urban planning and policy, my professors have continually reiterated that in any urban intervention, there are winners and losers. At first, I understood these winners and losers to be determined on a case-by-case basis. I imagined a planner weighing pros and cons, contemplating stakeholder interests, and ultimately planning for the most achievable common good. In a semester and a half, my naiveté has dissipated into pure pessimism. In this globalized world, the role the built environment plays in the accumulation of capital is disturbingly clear. The version of capital accumulation I will refer to is based on David Harvey’s description of neoliberalism and particularly the ways it effects the built environment. In this sense, the state is an enabler and preserver of private property rights, the guarantor of the security and legal structures required to preserve private property rights, and the creator of new markets for private exploitation (Harvey 2005). Returning back to the idea of winners and losers in the production of space, understanding the broader scale of who and what the built environment is produced for can only be understood through the neoliberal economic policies that not only drive but are foundational elements of urban development today. At the government level, development policies are created and justified by the claim that large-scale projects, neighborhood redevelopment and downtown renewal benefit the public good. When urban interventions effect the entire city, the region it is a part of, and in some instances the nation as a whole, the idea of winners and losers becomes much more suggestive of an entrenched system of preference for a certain public over another. Who is this public that these urban interventions benefit, and how is this public created? Additionally, what becomes of the other publics, and who builds spaces for them? The process of negotiating the public good certainly predates the advent of neoliberalism, and Ehrenfeucht and Loukaitou-Sideris’ discussion of sidewalk usage in 19th and 20th century Los Angeles provides a solid starting point for examining the tensions between public and private usage of space, as well as the creation of policies based on a preferred usage for “public” space. The public space referred to in this article is municipally created sidewalks and streets, and the interested stake holders included the municipality, the street vendors who used the space to sell vegetables and food, the local population who purchased from those vendors, and the citizens of Los Angeles interested in using the sidewalks as a primary route for circulation throughout the city. Ehrenfeucht and Loukaitou-Sideris dissect the nexus of interests in Los Angeles sidewalks by examining the negotiations concerning obstructions, maintenance, speech and vending (p. 111). The authors point out that the involvement of private actors in the improvement of public space was indeed occurring during this time period. Because street improvements undertaken by the municipality directly contributed to increasing the value of adjacent properties, many private entrepreneurs contributed to the infrastructure upgrading (2007 p.112). In the instance of Los Angeles sidewalks, a spectrum of publics was revealed through the process of negotiation to establish the public interest. While the transportation-minded publics and the engineering-minded government officials deemed circulation to be a priority, vendors and those who purchased their wares identified with a different public interest. Ultimately, the enhancement of circulation was preferred over the right of vendors to use sidewalk space, and this preference was codified in city ordinance. However, different publics continued to seek access to the sidewalks and through the process of amendment the ordinance continued to reflect that ongoing debate. What is striking about the example of 19th and 20th century Los Angeles sidewalks is that it reveals a bit about the processes today’s pseudo-private, neoliberal cities may be eliminating. While by no means perfect, the process of negotiation in 19th and 20th century Los Angeles kept the many publics and the interested private enterprises on a relatively level playing field, with municipal and legal institutions functioning as a forum for that negotiation to take place. The use of institutional structures for public negotiation in Los Angeles contrast significantly from those utilized for the redevelopment of New York’s Times Square as chronicled by Kristine Miller (2007). While in Los Angeles the definition and production of public bodies and public spaces remained an open interaction between the municipality and citizens utilizing legal frameworks to negotiate space, the story is very different in Times Square. Miller argues that the discourse in Times Square was not about what the public could or could not do in the Square, but who New York City leadership and their private sponsors deemed to be the proper public for the Square. The redevelopment of Times Square cannot be viewed as independent of New York’s leaderships idea of public interest simply because the land set for redevelopment was acquired through eminent domain. However, Mitchell pointedly states that within New York Consolidated Laws, public interest is relatively undefined, and the laws merely stipulate requirements such as just compensation and that a project must be for a, “public use, benefit or purpose” (2007 p.47). Despite this loose definition, I would argue that in the eyes of New York leadership, the redevelopment of Times Square was justified as serving the interests of publics they deemed desirable- most specifically those publics contributing to Times Square through consumption and the provision of consumable goods. In this sense, the redevelopment of Times Square was about spatially dictating appropriate functions and users of space while eliminating the original users. The original users were deemed to be an undesirable public that promoted or at least harbored vice, unsavory behavior, unhygienic activities and low-end consumption. The new envisioned Times Square was a space for high-end, touristic and internationalized consumption. While in the Times Square debate, issues of physical blight and misconduct were used as legal justifications to acquire property by eminent domain in order to rejuvenate the economic potential of the project space, officials in the United Kingdom used misconduct as the public justification for spatial restructuring and give the consuming public a way to “reclaim the streets” (Jayne, Valentine & Holloway 2008). Physical blight in urban neighborhoods was not the target of officials, but behavior – particularly excessive drinking- was considered a blight preventing the preferred publics orderly consumption. The attempts at spatial restructuring undertaken in British cities to sequester undesirable drinking behavior also represent a different approach to dealing with undesirable publics. While in Times Square, the venues frequented by undesirable publics were destroyed and replaced with venues likely to attract more desirable publics, Stoke-on-Trent took steps to separate or zone civilized behavior from uncivilized behavior (Jayne, Valentine & Holloway 2008). What can we deduce from the city’s decision to provide a specific quarter for undesirable behavior? On one hand, Stoke-on-Trent’s decision to specify a zone for the undesirable behavior it sought to combat is realist in that policy makers recognized that British binge drinking practices could not be eliminated altogether. On the other hand, such a policy can be interpreted as reflecting the city’s desire to “have its cake and eat it too”; by sectoring the city into zones for low-brow and high-brow drinking and entertainment, Stoke-on-Trent can reap economic benefits from both the uncivilized and civilized publics. The Carousel Center demonstrates the slippery slope of privatization well; the combination of the prioritization of consumer comfort with an enclosed private space helps to rapidly change our perceptions of what is and is not public space, as well as what is or is not appropriate behavior in public. If downtown Syracuse is no longer a viable space of consumption, does that mean it is no longer a viable public space? Additionally, if developers’ ideal space of consumption is a place protected from uncomfortable encounters with people of different classes, where can political protestors, picketers or individuals with grievances be heard? The identification and promotion of a certain public is also well demonstrated by Setha Low in her chapter “Clean and Safe? Property Redevelopment, Public Space, and Homelessness in Downtown San Diego.” Low argues that the creation of an acceptable public and the exclusion of an unacceptable public was justified in order to establish urban renewal in San Diego’s downtown district. The unacceptable public was discouraged from using the space through a combined strategy of design and security. In Low’s example, park benches were modified to discourage sleeping in order to exclude the homeless population. The green spaces of public parks were replanted as prickly greenery to discourage people from sitting or sleeping. Police and privately hired Community Ambassadors worked in tandem to discourage unwelcome behavior. Low frames San Diego’s downtown renewal by examining the politics of property. Low rejects the simple dichotomy of space as either public or private, and suggests two additional forms of property to consider. The first form is the “pseudo-public space,” best exemplified by the suburban mall downtown. The second form is the “pseudo-private space”; a space owned by the state and public, but subject to control and regulation by private interests (Low 2006). Low argues that the hybridity of “pseudo-private space” is ultimately more destructive than outright privatization because it transforms our notion of publicity. She states, “It transforms the meaning and practices- the regime-or property such that the very expectation that there is a public good is undermined” (2006 p.153). She further argues that “pseudo-private spaces” are cornerstones of redevelopment projects which favor accumulation as the main reason for maintain and improving public spaces in the city. Returning briefly to Syracuse: if the only space in a city for accumulation is an isolated suburban mall, do the downtown public spaces that are not adjacent to spaces of consumption lose their right to improvement? It is interesting to think of a space such as Solidere as “pseudo-private space” similar to downtown San Diego. While San Diego sought to eradicate the discomfort caused by homelessness to the consumer population, Solidere seeks to eradicate the low-class public and the apparent ills associated with them. By embracing this notion of “pseudo-private space,” the Lebanese government and Solidere have prioritized accumulation in the Beirut Central District (BCD), and through a combination of design and security, actively seek to protect the access of an acceptable public while discouraging access to the unacceptable public (those not contributing to accumulation). While attempting to compare Solidere to spaces such as Times Square or downtown San Diego, a key difference stands out; following the civil war in Lebanon, the BCD was war-torn and uninhabitable. The choice to allow a private company to take control of the downtown district was made based on the claim that the government did not have the capability to rebuild the district quickly. The development of the BCD is touted on billboards as propelling Beirut back to its former glory, but looking at the effect of Solidere on Beirut as a whole reveals a different story. Considering the generally positive public opinion of the design interventions in Times Square, San Diego, the Carousel Center, and downtown Beirut reveals the real danger of privatized developments that create pseudo-public spaces. Our idea of publicity is being transformed by every privately financed city sewer pipe installed and every private security guard hired. If consumption and the accumulation of capital continue to play such a central role in the production of space in our cities, and if political protest and the lower classes remain antithetical to those goals, the preferred public is the silent and rich. If this neoliberal model of privatization continues, we must seriously ask ourselves who will build the city for everyone else. Ehrenfeucht, R and Loukaitou-Sideris, A (2007). Constructing the sidewalks: municipal government and the production of public space in Los Angeles, California, 1880–1920, Journal of Historical Geography, 33(1): 104-124. Holloway, Sarah (2008). Fluid Boundaries-British Binge Drinking and European Civility: Alcohol and the Production and Consumption of Public Space. Space and Polity, 12(1): 81-100. Low, Setha (2006) Clean and Safe? Property Redevelopment, Public Space, and Homelessness in Downtown San Diego.” The Politics of Public Space. Low,Setha & Smith, Neil. Routladge. Miller, Kristine (2007). Designs on the Public: The Private Lives of New York’s Public Spaces, Minneapolis: University of Minnesota Press (Chapter 3: Condemning the public in the new Times Square, pp. 45-70). Staeheli, Lynn and Mitchell, Don (2006). USA Destiny? Regulating space and creating community in American shopping malls, Urban Studies, 43(5-6): 977-992. So, I have an iPad, and it has served me well. After moving countless times in the last 8 years, I am tired of packing up all my books and letting them sit in my Dad’s basement- the iPad allows me to keep the books I buy with me wherever I go. As a masters student, I download all my reading onto my iPad instead of getting it printed at the printer, saving thousands of pages in a single semester. This iPad also does other magical things, like deliver books wirelessly to me that I would not otherwise be able to buy in Lebanon. eReaders in general save paper in many other ways- on my iPad I get 4 magazine subscriptions, buy countless books, and read the New York Times every day. All those pages must add up. But what about that voyage across the Pacific that my iPad took? Do the toxins emitted from that ship cancel out all of my saved paper? What about the economic system that has placed that iPad factory in China in the first place? Do my few thousands of saved pages make up for the fact that a woman in China is making next to nothing to put that iPad together? Or what about the fact that my own country will inevitably suffer from our position as a tireless consumer of imported goods? Or…what about the fact that I can only buy these online books from major corporate, profit-driven booksellers such as Amazon.com and Borders? That’s what has me worried- I don’t want to go home to Point Reyes this summer and be a hypocrite. I want to buy books from Point Reyes Books. Point Reyes Books supports my local community with donations, by hosting great events, and by employing locals. But Point Reyes Books can’t zoom books onto my iPad. When I leave after the summer, I will have to leave my poor books behind, sitting on the shelf, when I wish they could be with me. So far my solution is this- there are books I have not been able to buy on my iPad. Jane Jacobs: The Death and Life of Great American Cities is one of them. Apparently a major American classic is not worthy to be on the iPad. It was, after all, written in 1961. Sometimes I wish I didn’t know about the incredible impacts a small local business can have. I wish I didn’t see the consequences of the neo-liberal economic mantra which is rotting my country from the inside out. I wish I could tell myself that the pollution created by these corporations that feed our consumerism is really just us using our God-given ingenuity on this earth God gave us because that is what God wants us to do. But I can’t. The more I learn about urban planning, the more I realize that the small town that I come from is as close to a utopia as it gets. For so long the insulated community and slow pace of life repelled me, and during Christmas breaks two weeks in Point Reyes was nearly more than I could bear. But at the simplest level, the people of Point Reyes have claimed their rights to dictate what happens to the land, buildings, and environment that surround them. They have said no to the corporatization of their town, and have resisted the encroachment of the state government and its privatized service providers. Only from Beirut, while studying urban planning and policy and hearing stories of utopia’s never realized, have I been able to realize how incredible my hometown is. Point Reyes is a quaint town 50 miles north of San Francisco, nestled between rolling hills and a sharp majestic ridge at the base of Tomales Bay. Populated by the odd bedfellows of ranchers, artisans, migrant hippies and Mexican immigrants, Point Reyes is regionally known for its liberal, independent bent. With no town government structure, Point Reyes’ official voice comes in the form of a district supervisor. So who plans Point Reyes? Who responds to the needs of the community? Well, the citizens, of course. Since my childhood, Point Reyes has been full of active, vocal, community-oriented citizens that outright reject the notion of corporations infiltrating their town and are willing to attend county meetings to make sure their voices are heard. Point Reyes, along with other county communities, is currently fighting the instillation of “Smart Meters” by Pacific Gas & Electric. These meters constantly emit short bursts of electromagnetic transmission, and have not been fully studied for potential health risks. My Mother- originally from Indianapolis and tends not to be interested in politics, community activism or anything else that requires contact with other humans- had been attending the meetings where the leaders of the “No Smart Meter” movement have explained their concerns to the community. She said she wasn’t concerned when she first heard about it, but word of mouth and the meetings had convinced her she didn’t want a Smart Meter in our home, and she was able to coherently explain to me why. I was immediately suspicious, and knew I had to find out more about these people who had against all odds inspired my Mother to wrap a “No Smart Meter” sign around the box in our front yard. What exactly was afoot in Point Reyes? Out of curiosity, I recently joined an online community forum started by a group called West Marin Commons. I wanted to know how vibrant this apparent community of activists that I have seemingly dismissed really was. It turns out that this West Marin Commons is creating a new community dialogue- one where the community comes first, and the people’s voices are able to create the imagined future of the town. Over the past few years, this community spirit has manifested itself in many ways: from the creation of public spaces such as a walking trail and a community garden to hosting community harvest dinners and organizing shared transportation and the money-free exchange of goods. The community spirit that had inspired my Mother to take a personal stand against Smart Meters and the work of West Marin Commons, which brings together young and old to plant and plan, simply amazes me. I have noticed an uncharacteristic pessimism in my response to urban planning theory- perhaps produced by my last three years working for an unwieldy and unresponsive government organization. Suddenly, discovering that my hometown is making the romantic planning processes that I initially dismissed actually work has me trying to re-evaluate. What about Point Reyes makes participatory planning and community driven initiatives work? For one, there is little anonymity in Point Reyes. Somehow, most people know one another. There is a strong sense of what the community doesn’t want. Along with that lack of anonymity comes the opportunity to build a real community. Second, Point Reyes doesn’t really have the “luxury” to sit back and let the mechanisms of governance work. While I have come to believe that the impositions of government top down planning often do more harm than good, it is interesting to think that a place like Point Reyes has never been planned by a planning commission, per say. Certainly the county has tried to come in and add a stop sign here, or re-pave a road there, but it seems as though there is a lot of latitude for the production of space at the local, grass roots level. Even at such a small scale, it is fascinating that groups such as West Marin Commons have decided to not only to work on public spaces and community projects, but also to create local dialogue about the foundational issues of production by encouraging local exchange and barter systems and keeping monetary wealth in the community by buying local. The fact that the neoliberal epidemic of privatization has not reshaped Point Reyes makes me wonder either how we avoided it or why it never came for us. Is the answer to this question one of scale? Is it affected by the fact that most of the wealthy businesses in Point Reyes do not own the land that they produce on because it is part of an agricultural land trust? Or is it Point Reyes’ natural aversion to anything mainstream? I have always felt a bit uncomfortable with Point Reyes’ “anti-establishment” vibe, but it is starting to grow on me. Knowing that my town defies the odds by planning for itself actually impresses me. These days it seems the meager political representation Point Reyes has is unwilling or unable to stop the installation of Smart Meters against the will of the people. However, the people have not given up. A recent post on the community forum warned residents of a Smart Meter truck sighting. Over the course of a few hours, new posts popped up, updating the status and location of the truck, calling on kindred spirits to go and confront the installer. The sense of community that has been created in Point Reyes gives latitude to divergent opinions while respecting common values and elevates the rights of its citizens to choose what is imposed upon them by the outside world. I’m rooting against the evil meter matrons from afar, hoping they have to encounter my Mother’s wrath and hear her community-developed articulation of why the Smart Meter isn’t for her or our town.